To being with the outer appearance, the vehicle comes equipped with various attractive features that make it look distinct and stylish.The front fascia is quite appealing and comes with a wide & fashionable grille on the front end.The base and the middle trim are integrated with matte black top as well as the bottom bezel. On the other hand, the top variant is fitted with a glossy carbon front grille. For clean visibility, the front windscreen is mated with a washer and a pair of 2-speed option wipers. To give away a uniform look to the vehicle, the front as well as the rear bumpers comes painted in body colour. In top models, side mouldings are provided which are painted in body colour.The external wing mirrors and outside door handles are designed in body colour for mid-level and top variants only. To enhance the rear looks of this variant, high mount stop lamp onto its windshield are integrated. Fog lights with clear lens are fixed into the front bumper of the high end trims. Space is one of the main issues that often co-related with compact vehicles be it a sedan or a SUV. But with Verito Vibe, space is one thing you need least to be worried about. Apart from space, Mahindra has given a premium look to the interiors and several impressive features that make this car look refreshing and spicy. The first thing that impresses is a light color dashboard with smart black colored finishing touches. The large steering wheel with a big horn pad is backs by tachometer, speedometer, and a bright orange digital gauge that aids visibility in day light too. The center console is marked with two round shaped AC vents, a CD player, and within reach controls. The fabric inserted door trims and plush fabric upholstery give add premium flair to car’s cabin. The dual tones seats offer comfort along with sufficient elbow room and shoulder room. The rear seats are wide and can comfortably accommodate three full size adults. All seats are accompanied with head restraints ensuring utmost comfort to their accommodators.Along with ample space, the car cabin has been blessed with numerous storage spaces that can accomplish all your big and small storage needs. A large parcel shelf, a mobile holder, a bottle holder, map pockets, and a rear parcel shelf are some of the noteworthy storage spaces offered in the top model of the car to add to passengers comfort. Apart from these major comfort features offered in the car include a powerful air conditioner, cabin heater, a 2DIN CD player, USB interface, AUX-in support, remote control for music player, head restraints over all seats, theatre dimming lights, a bright trunk room light, rear windscreen defogger, power steering and windows, central lock, day/night rear view mirror, a computerized driver information system, a handy gear shift knob with silver finish, headlight on warning buzzer, sun visors for driver and front co-passenger, and a few others. Chopping the Verito’s tail hasn’t had much of an impact on the handling. The Vibe feels just the same as the Verito and that means a benign, dynamic character. The Vibe doesn’t enjoy darting into corners or carving up a twisty road but handling is predictable and inspires confidence at high speeds.As for the ride, there weren’t any potholes or bumps on M&M’s Chakan test track to give us a real-world perspective but, the slight undulations on the track were quite easily taken care of, with the Vibe maintaining a flat ride. Mention must be made of the relatively tall profile 185/70 R14 tyres, which promise to do a good job in rounding off sharp edges and potholes. Apart from ABS and EBD, this trim comes equipped with an airbag on the driver side which reduces risk of injuries at the time of accidents.The collapsible function of the steering column helps in avoiding injuries to the chest during collision. Fixed seatbelts are available in the base trim but the high end trims come with adjustable front seatbelts. Apart from these, an immobilizer is mated in all the variants of this vehicle. It helps in freezing the engine at the time of unauthorized entry to the vehicle. The rear doors are integrated with child lock system which makes this vehicle child friendly.The entire series of this vehicle is blessed with an efficient suspension mechanism and reliable braking system. A set of disc brakes is fitted in the front wheels while the rear wheels have a set of standard drum brakes. For enhanced braking efficiency and excellent grip, the top end variants are equipped with an anti-lock braking system (ABS).Along with ABS, this series comes with an electronic brake force distribution (EBD) for better control over the vehicle. A McPherson strut with wishbone link is mounted on the front axle. The rear one is incorporated with H-section torsion beam with deflection-coil spring. Mahindra Verito Vibe is a low maintenance – high mileage car and is a perfect option for regular usage in all Indian families. The car presents an optimum combination of robustness, performance, comfort, and mileage which are basic needs of regular car buyers. Through its sophisticated comfort features, unique design, competitive price, and great mileage, this compact sedan carries all potential to give you best value for your money. Competitive pricing and above average engine performance are some of the main reasons that make this car stand apart from its major competitors. Though Mahindra is a new player in sedan segment, but the brand in itself is a symbol of reliability and trust among Indian consumers. So, Verito Vibe can be trusted in terms of quality, features, and after sales service. A large network of dealerships and service centres ensures that you wouldn’t be at loss in any part of country whenever you have any problem with your car. Compact sedan segment is a very lucrative segment as the cars offered under this section offer all comforts and benefits of a bigger vehicle in small size and lesser price. Be it its exteriors, interiors, drivability, or power train, Verito Vibe wouldn’t be disappointing you on any front. The powerful 1.5-litre K9K series engine accompanied by its light weight body (kerb weight = 1155kgs) results in a better fuel efficiency. Adding another feather to it is its low maintenance that reduced its ownership costs to minimum making it one of the best in-budget options in respect to common Indian buyers. The smooth gearshifts and a light clutch ensure a refreshing driving experience within city as well as on highways. The design of the car may not appeal to all but interior comforts, safety measures, as well as overall convenience level of the car covers this small drawback very smoothly. Standard comfort features like air conditioning, heater, power steering, and a brilliantly designed instrument cluster have been offered across all three versions of the car ensuring a comfort-oriented ride in the most cost-effective manner to all its buyers. 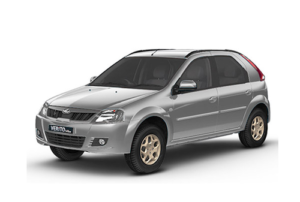 Mahindra Verito Vibe is one of the most affordable, value for money, reliable compact vehicles which can be trusted for its power, performance, and robustness.